The Mark Todd Horse Rug range is packed with high quality horse rugs made of the very best materials. And because each and every piece has been signed off by Olympian Mark Todd himself, you know you?re always getting the very best. Whilst there is a wide variety of types of horse rugs within the Mark Todd range, one of the most popular is the Mark Todd Air Mesh Combo. Let?s take a look at what makes this particular horse rug such a great choice. 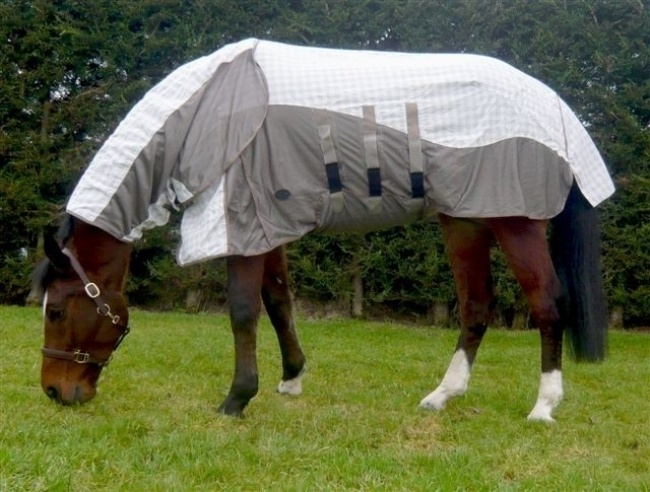 This horse rug is a lightweight summer rug which is ideal for keeping flies and other insects away from your horse?s coat. It offers excellent air flow and breathability, and includes UV protection for that extra level of safety while your horse is out on the field. On top of that, the Mark Todd Air Mesh Combo features an open weave mesh material, front buckles with loop fastening mechanisms, a high quality secure belly flap, nylon shoulder protection, adjustable leg straps and much more. Overall, the Mark Todd Air Mesh Combo is an excellent choice for anyone looking for a lightweight horse rug at the right price. The key to the success of the entire Mark Todd Horse Rug range is the fact that each one has been designed by a horse rider for a horse rider. Because Mark Todd?s years of experience are put into every single item in the range, you can always feel sure that you?re investing in the very best in terms of technology and style. There?s a lot of choice out there in the equestrian world, and Mark Todd has become an authority in the area of horse wear and accessories. The Mark Todd Air Mesh Combo is just one example of the kind of quality apparel that Mark?s range produces. Plus, every item is tested by real riders in real situations ? so you know it?s the best choice for you and your horse. The Mark Todd Air Mesh Combo isn?t just for keeping flies and biting insects away from your horse?s coat ? although it is perfect for this. It?s also for keeping your horse cool and shaded during the warmer months. We all know that horses can sweat a lot, which is why the Air Mesh Combo is made from a breathable material to maximise air flow. This keeps your horse cool, safe, and content, no matter how warm it gets out on the field. Plus, if you horse is kept indoors during the cold months, this rug is also a good choice for the simple fact that it will keep the flies away and stop dirt and debris from ruining your horse?s coat ? particularly useful if you take your horse eventing on a regular basis. Overall, the Mark Todd Air Mesh Combo is an excellent choice for anyone looking for a lightweight summer horse rug, or just a good all-rounder.